The expression ”anecdotal science” may well be a contradiction, as an anecdote can be far from scientific. When we are discussing bees, varroa, varroa resistance, bees behavior and similar things it may be a good thing to think about how we argue, the quality of evidences for different things, how we draw conclusions and what truth is. This is an extensive area for discussion. But I will here restrict myself to discuss little about the difference between anecdotes and science. If someone has another opoinion than you he may try to dismiss what you say by calling it an anecdote. By that he gives the impression that reports can be either anecdotal or scientific, as if there are just two distinct divisions of accounts, either it is anecdotal and thus not of any real value when drawing correct conclusions. Or it’s scientific and a good help in knowing the truth. Reality isn’t that simple. There aren’t just two different options when characterizing an account, an anecdotal or a scientific report. An anecdote is a brief, revealing account of an individual person or an incident. It is used to illustrate a point the author want to make. Evidence is anything presented in support of an assertion. The strongest type of evidence is that which provides direct proof of the truth of an assertion. Scientific evidence consists of observations and experimental results that serve to support, refute, or modify a scientific hyphothesis or theory, proposed explanations for a phenomenon. The best hypotheses lead to predictions that can be tested. The strongest tests of hypotheses come from carefully controlled and replicated experiments that gather empirical data. A scientific hypothesis must be falsifiable, implying that it is possible to identify a possible outcome of an experiment that conflicts with predictions deduced from the hypothesis; otherwise, the hypothesis cannot be meaningfully tested. Reproducibility is one of the main principles in science. It is the ability of an entire experiment or study to be dublicted, either by the same researcher or by someone else working independently. Often today when you are producing papers of tests, statistics play an important role when presenting results. If you get what is called a statistical significance you are said to have a result that can be trusted when used to draw conclusions. It is a difficult field and discussed in different ways. There’s not just two options, anecdote and scientific report. There’s a whole range of different characteristics of a report qualifying it to be placed somewhere in between the two ”extremes”. Even these two can be difficult to clearly define. The first important issue is to define ”aggressive”. But let’s say he used a definition that everyone can recognize to be true. The next problem is to decide how many colonies to be used in the test, and the heritage of the queens in the colonies (should they be sisters for example). About half of the colonies should be aggressive and the rest non-aggressive. The colonies should be of the same strength (from when) and have the same health statues. The worker bees should be very much dominated by the queens offspring (when should the queen have been introduced). These things I mention here are taken in consideration to avoid error sourcesto be able get a correct result. There are surely more error sources to avoid. In the ideal situation there will be enough obtained data to produce a statistical result that falsify or supports the hypothesis. If it supports the hypothesis you can draw the conclusion that according to the knowledge we have today the most probable conclusion that comes closest to truth is that the hypothesis is true. But the result does not exclude the possibility that future result will anyway falsify the hypothesis. New knowledge may enlighten how to better design a test and avoid an error source not previously known, for example. That’s science. It always leave open for new knowledge to change the conclusions made today, in a minor or major way. If no statistical significance has been obtained the results may anyway be pointing in a certain direction and a conclusion may be that the hypothesis is correct but more research is needed, probably with better designed tests. In one of the recent blogposts I wrote about non-resistant bee colonies against varoa mite, learning from resistant worker bees how to deal with the mites and being resistant. It seems now that these colonies that has learned resistance have to have worker bees from genetically resistant colonies drifting into them continuously to stay resistant. This resistance went on for at least a couple of years. I referred to experiences of Hans-Otto Johnsen and Terje Reinertsen (http://www.elgon.es/diary/?p=880)in Norway and Magnus Kranshammar (http://www.elgon.es/diary/?p=890)in Sweden. A.) In the Norwegian cases colonies with queens from non-resistant stock originally were kept in apiaries together with resistant bee colonies. Bees are kept on small cells. B.) In Magnus’ case it was somewhat similar as the colony of the original queen, which was the result of genetically selected resistance, and splits from it with queens of originally non-resistant stock, were kept in the same apiary. The total number of colonies was not big here. These bees were kept on large cells. A.) A couple of years ago Hans-Otto started a variety of the first tests he made mentioned in the blogpost above. He introduced virgin queens of non-resistant stock into splits from his Elgon-stock. 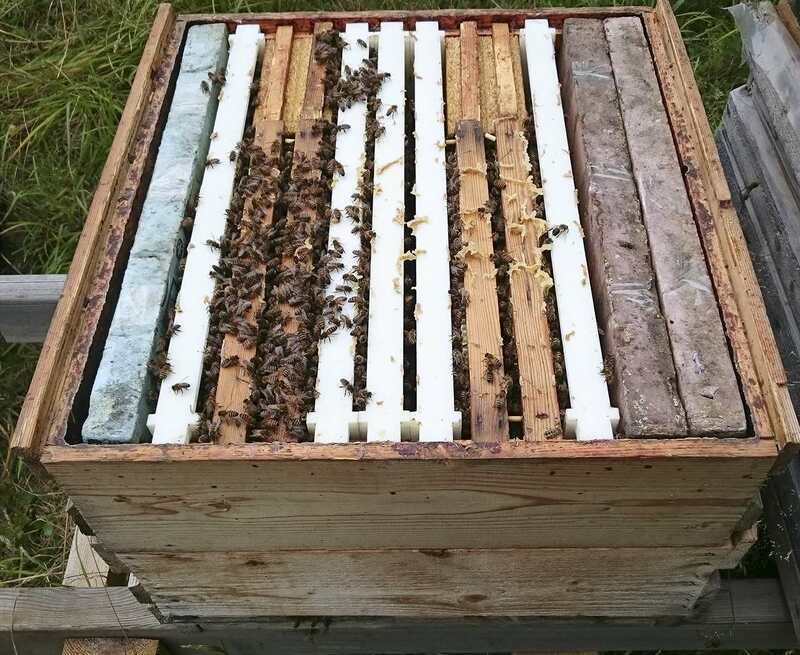 In this test he didn’t place these new colonies in apiaries together with his resistant stock. Instead he placed them in an apiary of their own in the forest, a lot more than 2 miles (3 km) from other bees. For two years these colonies functioned without problems concerning Varroa. This autumn they all showed crippled winged bees. He made a test with the Bee Shaker (http://www.elgon.es/diary/?p=794). About 35 mites from 300 bees. 11-12% Varroa level. Probably there was resistance in the colonies at least the first year as long as the old worker bees were alive. B.) Two splits from a colony with a queen of non-resistant stock, which anyway were resistant, were moved to an apiary of their own in a forest about 2 miles (3 km) from other bees. The mother colony of the splits was kept in the same apiary as the colony with a resistant queen (which was still alive this year). It was this resistant queen’s colony that gave bees to this mother colony of the described splits. So you could expect some drifting had occurred with resistant worker bees now living in the colony with the non-resistant queen. Thus some good resistant worker bees were living in the splits as well to begin with, until they died their natural death. Drones from the non-resistant queen of the mother colony of the splits were of course present in these. But of course there were also drones in some colonies 2 miles (3 km) away. Those colonies were of Elgon heritage, but not of the very best variety of resistant stock. The splits got virgin queens from an Elgon colony of good resistant quality. The Varroa level was initially very low in the splits, about 0.3% (without treatment this year or the previous year). The splits developed very well after the queens were mated and laying. In the beginning of September the Varroa level was 2% and 3.3% respectively. It had increased more than expected, but was not alarmingly high. The cell size in those splits was initially 5.4 mm, that is large cell size. (Resistant thus in spite of the large cells.) The story of those bees are told here: http://www.elgon.es/diary/?p=890. But the virgins came from established small cell size colonies since many years. The plastic combs used for increase were small cell. The 3.3% part had relatively somewhat more left of large cell combs. One of the splits in case B. The original large cell combs are of an old Swedish (as well as an American) size, 12”x12” (30 x 30 cm). With the help of adapters these combs are placed in boxes which hold Jumbo sized frames (448 x 286 mm) plus a deeper bottom board. The combs used for increase are small cell plastic Langstroth from Mann Lake (http://www.mannlakeltd.com/beekeeping-supplies/category/page19.html). C.) In a project that has been going for a couple of years now, one apiary was placed a lot more than 2 miles (3 km) from other bees. The queens were of non-Elgon, non-resistant, large cell bees. They were introduced into Elgon colonies on small cells in 2013. In autumn 2014 they were moved to their test apiary and treated with a small amount of Thymol to ensure an in the test initially small and quite even population of Varroa mites. They had during 2014 been standing in apiaries with Elgon colonies. Thus probably containing some drifted Elgon worker bees. The test apiary was poor from a nectar point of view. In 2015 the Varroa level in autumn was low, around 1%. A split was made during 2015 and queens shifted to daughters made in the split in two of the units. The virgins were mated in this apiary. One of the originally queens, all had been sisters initially, were still left in its colony. The new queens were of course very inbred as the available drones were very closely related to the virgins. In the middle of the summer 2016 the Varroa level was 3-4%. A couple of weeks later all three colonies showed crippled winged bees. They were treated with two pads with 5gr Thymol each (once) after which they recovered. 1.) Worker bees from a resistant colony can be united with a non-resistant colony through shifting the places of a resistant and a non-resistant colony. Most of the other colones in the apiary are resistant. It is uncertain how many of the colonies that should be genetically resistant. 2.) 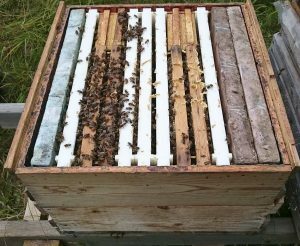 Splitting a resistant colony and giving the split(s) virgin or laying queens of non-resistant stock. To maintain this resistance achieved, still with a queen of non-resistant stock in the colony, when the first resistant worker bees that came along with the splits are worn out and dead, new resistant worker bees have to come into the colony in some way. (Resistant worker bees are bees in colonies that show resistant behavior to such an extent that their colony can rid themselves of mites through different kind of hygienic traits.) It seems the number of resistant worker bees needed to come from other colonyies “per time unit”, are not very many. By just keeping the colony in an apiary with resistant colonies this seems to be achieved, probably through drifting of worker bees between the colonies in the apiary. In all cases above, A, B and C there were no new resistant worker bees drifting into the colonies. In case B though virgin queens from a resistant queen were introduced, but no new bees from the original resistant stock were re-introduced. Instead new workers with probably better genetic set-up for resistance were born. But there were now probably no, or very few, resistant worker bees left that could teach newborn bees. At least this is a conclusion that is close at hand, to explain the increase of the Varroa level. It will be interesting to see what will happen further on in these two colonies. Hopefully the virgins were mated to other drones than those that came along in the splits from the genetically non-resistant queen. It is thus no shortcut to get resistant bees, to split genetically resistant colonies and introduce whatever kind of queens into those splits (of non-resistant heritage)! What these experiences tell us is how important it is to increase your number of colonies and replacing the dead outs by splitting the best resistant colonies. The very best might many times be to let those splits raise their own queens. And in addition to this breed queens from good resistant colonies of good heritage in being resistant.